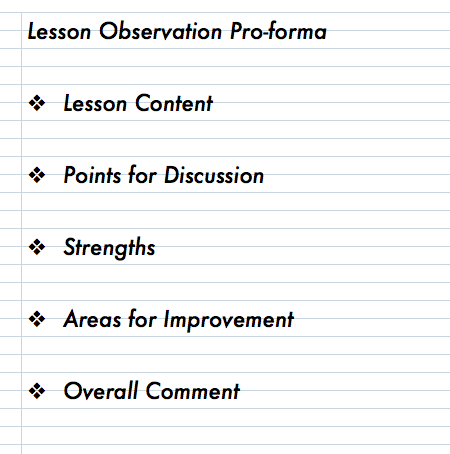 The structure of our BlueSky lesson observation reports. Simple. Ok. The title is misleading. On purpose. I’ve been observing the newly appointed staff at Highbury Grove over the last few weeks which has been a real pleasure. For the first time, we’re now using the Bluesky website to write all of our lesson observation reports; this links to our Professional Review documentation, handily keeping everything in one place without any paper or a trail of files across the network. The pro-forma is super-simple as shown in the image above. As Head, I can then access all of the lesson observations via various reports. Once populated, I will be able to look at all the strengths of NQTs or all the Areas for Improvement in the Science department or all the observations for any given member of staff over time. All this is about the details, we do not grade lessons – obviously. Reflecting on the process of undertaking the most recent batch of observations, I’ve been thinking about the question of checklists. This has been covered recently by Martin Robinson in The Madness of Observation Checklists and David Didau in What can education learn from aviation . Although we don’t have an official checklist – and, in principle I’m not in favour of them – I wonder if I have a de facto checklist that operates when I’m observing. I think that I do; it’s not hard and fast but naturally covers the range of things one might see in a typical lesson. It’s a set of questions for me to answer so that I get the most information I can out of the observation rather than a list for each teacher to run through. I’m always reminding myself that any one lesson can only give clues about the longer-term learning process and, when I know a teacher better, I’m always triangulating with the other information I’ve had before. Observing a lesson is one tiny element in a much bigger process of supporting the professional development of a teacher and of doing the part of my job that is about securing high standards across the school. Are the Behaviour for Learning routines effective? This kicks in right from the start of any lesson. It’s usually possible to tell whether expectations are set high – even though there can be a big observer effect. I’m looking to see that our BfL C-codes are being used and that the basics are dealt with. A big area is the business of securing full attention whenever needed and not tolerating an under-current of chat. A common issue to address is when instructions or explanations are given without first securing full attention. I often comment on rapport; some teachers are really very good at being assertive and strict whilst maintaining warm friendly relationships; others might need to warm up or tighten up. Are the Learning Goals clear? I’m never looking for LOs written on the board. I’m just keen to establish what the key purpose of the lesson is. It should be obvious, not a mish-mash of bits of content strung together. Is there a key question, a central theme, a key concept, a core skill? I think students should know what that is – regardless of how it is expressed. Part of the way in to an observation, I ask around. What’s this lesson all about? I should get a decent answer. How does this lesson fit into the wider sequence of learning? Using books, by listening to the teacher or asking students, I try to find out what went before and what is coming next. That helps to gauge whether the lesson is well constructed and gives a sense of the longer term learning objectives. I often ask teachers to tell me when the work is finished later on so I can see where it all led to. Does the teacher seem confident with the material? Does the teacher model how things are to be done and the thought process? I think subject knowledge is an essential element in effective teaching. I’m obviously not a subject specialist in every area but I can tell if a teacher is confident in what they’re doing – and so can the students. Where teachers are oozing confidence in the material, it inspires confidence in everyone else. If I detect a bit of busking, if the ideas don’t flow or the teacher finds it difficult to answer students’ questions, this is a central area for feedback. I’m a firm believer in the role of modelling in many contexts. I’m not expecting the swimming teacher to dive in to give a demo but I do expect teachers to model writing, solutions and, above all, the thought process that leads to high quality, accurate and/or imaginative work. Students can also be asked to model exemplary work to their peers. Does the content seem appropriate, challenging; is the sequence and scaffolding of concepts, ideas, skills sensible? I agree with Michael Fordham who has suggested that senior leaders should be more interested in the content being taught, not just the delivery. I am VERY interested and engage in this question in several ways. During a lesson observation I want to see that the topics seem relevant for the age group; that the highest achievers seem challenged; that the scaffolding isn’t too gradual or too rapid. I am interested in the depth versus the pace. I want to know why they’re studying Elizabeth I in that way, whether the PE skills have a good balance of integrated and component skill development; I will check that the grammar in MFL is developing alongside the vocabulary and that science and maths concepts are being drilled to a depth that is genuinely challenging and accurate. I want to see that writing skills and content/knowledge are being integrated sensibly in English and humanities, with different modes of assessment. What does in-lesson assessment look like? How can the teacher tell if students have understood? There is a wide range of practice. I’m not looking for anything specific but I’m keen to see that teachers have good AfL techniques in play, involving as many students as possible. How effective are the question and answer exchanges? Does the teacher explain well? Questioning is a central teacher skill. Does the teacher probe enough, involve all students, give good answers, expect full answers, change tack and re-phrase when students get stuck. Again, I’m very conscious that in any one lesson you might only see one or two modes of questioning. Anything you see in a lesson is really just a platform for further discussion. Is there an emphasis on progress, improvement and practice? I’m increasingly keen to look for this. I know some lessons can legitimately focus on input – with response and practice to follow – but I want to know that students have plenty of practice and that improvement is a strong theme. It’s good to see redrafting, corrections, fast looped perform-feedback-improvement cycles, time given to heads down practice. If a task is going to be a one-off or is long-running, I want to see that feedback is given during the process. In all subjects, do students have opportunities to put the ideas into practice on their own; to follow the examples? Often, lots of ideas and concepts can be tossed around in the discourse with a few selected student responses so it is important for tasks to follow on that allow every student to practice. How are different students responding/engaging/progressing? Part of the observation process is to look for outliers. Those that hang back; those that dominate; the weakest; the strongest. How is everyone doing? Does the teacher seem to have a plan for them? Do they notice the student who didn’t speak or write during the lesson? I’m not expecting silly differentiation in every lesson; I’m expecting to see evidence of the gardening approach as described here. What do the books /folders tell me? Are students’ literacy needs being addressed? Increasingly I am looking to see that students are given opportunities to read appropriately challenging material as part of their lessons and that teachers take time to explore the meaning of key words as they emerge. We’re in the process of getting a whole-school rhetoric initiative off the ground and I’m looking to see how that is going. It’s always great to see a set-piece structured speech event but, more routinely, I like to see simple strategies such as the ‘say it again but say it better‘ approach. Do students’ views of the learning support what I’m seeing? As part of any lesson observation, I try to get students’ views of what is going on – during that lesson and before. Do they know what is happening? Do they know what is coming next? Do they know about the exams, the next tests, the homework? Can they explain the key concept in hand? Most often the students just confirm my own sense of things; occasionally they have a perspective that suggests the teacher might need to address certain things. I always try to watch a full lesson. Ending well matters. It’s great when teachers can wrap things up coherently and calmly so that students leave the room knowing where things stand ahead of the next lesson. From all of this I draw out the points for discussion, the strengths and areas for improvement for the feedback session and report. If there are significant concerns, that is stated clearly. Mostly, everyone has a balance of strengths and areas to work on. Quite often I feel that, in practice, a particular lesson couldn’t have been much better; it’s just a case of using the lesson as a talking point, raising questions and discussing wider issues. It has all been made so much easier and healthier – not to mention more robust and rigorous – now we’re not in the business of making judgements or giving grades. I try my best to make the feedback sessions as positive an affirming as possible. A lesson observation isn’t an end itself. It is always only one small part of a bigger process. It’s only worth doing if your observations support the teacher by motivating them and providing information and ideas that might lead to improved learning outcomes for their students. Of course it is all the lessons that are not observed that make the difference. The observation process needs to have an impact on all of those lessons if it has any value at all. « Modelling Good Speech. Let’s talk properly. Lesson observations are one of the most powerful ways to raise standards of teaching and learning, but only when teachers are empowered in the process. There does seem to be a ‘sea-change’ in monitoring the quality of teaching. I remember a new head talking to me at the first meeting of the term, telling me that at any point in a lesson, she would expect to see outstanding teaching. I argued that ‘snapshots’ like this would tell her nothing. We had the ‘all singing, all dancing’ teachers who always seemed to get outstanding grades for their lessons and yet I secretly knew that their subject knowledge was not up to scratch or that they worked on a basis of ‘one-upmanship’ against their colleagues. I also witnessed lesson observations where different teachers were given different weightings for exactly the same issues, depending on their relationship to the observer. When I had the (rare) opportunity to observe lessons for IT or science, I resisted doing this on a grading basis. I tried, a long time ago, to instigate a process which involved the observer having a full discussion with the teacher about the topic, the thinking behind the lesson, the hurdles and pitfalls they had perceived and planned for, etc. I wanted to get the whole idea – not see (or miss) the bright and shiny things in a snapshot. Personally, I had observations in which my lessons were judged ‘outstanding’ which always seemed to leave me feeling rather flat because I knew, deep down, that the observer couldn’t really know that and on the other side, lessons which were deemed ‘unsatisfactory’ which left me devastated or furious because the observer had failed to see the lesson in the context of its place in the process of the learning I was tried to develop. I like this. The only thing I’d query is: “Is there an emphasis on progress, improvement and practice?”. This contradicts the research summarised by Didau regarding the focus on progress over learning. Would it not be better to see if there is a focus on “Explaining, Modelling, Scaffolding, and Practising”? Maybe. By progress, I mean that the lesson seems to contribute to a longer term process where progress might be evident. The books tell you a lot about this…not the teacher’s performance or any specific task. I’m absolutely not looking for evidence of progress within the lesson. Eg the idea that I could tell whether students are better at French at the end of a lesson compared to the start; that’s a delusion I’m not afflicted by I hope. Worth reading Joyce the stuff written by David Didau about how progress isn’t the same as learning – and that they involve different methods of delivery. A very interesting read, thank you. As a teacher, this seems like a checklist that I would be looking to meet over the course of my teaching year; there is nothing worse than trying to second guess what’s going on in an observer’s mind, it’s great that your teachers can see this. I do worry about what observers will see when they look in my students’ books. I’m a maths teacher. Generally it will be a lot of answers to maths questions from the textbook! Is there anything else (apart from judicious interventions by marking) that you would be looking for? Examples of model answers, redrafting and corrections, self checking and general standards of presentation. I’m glad to have come to this sight. I just finished an observation of my own peers. One was all over the place where the induction didn’t quite meet the objective of the lesson. The other was more spot on & helpful in eliciting the right response – it was truly identifying the form, meaning & use of the phrasal verbs & idioms taught.